Consumer Guide to Buying Furniture - Are Flame Retardants in Your Sofa Killing You? I'll try to keep this guide straightforward, and add detail to it later in response to specific points anyone raises. I will give you what I've learned in 15 years of working in this field, as simply as possible. But be warned: there aren't always straightforward answers; sometimes, you may have to choose between more or less of one kind of safety against another. I am not paid for producing this guide and I do not work for any business interests. My only concern is in providing accurate information to consumers, especially since for various reasons it's very difficult to get hold of it anywhere else. 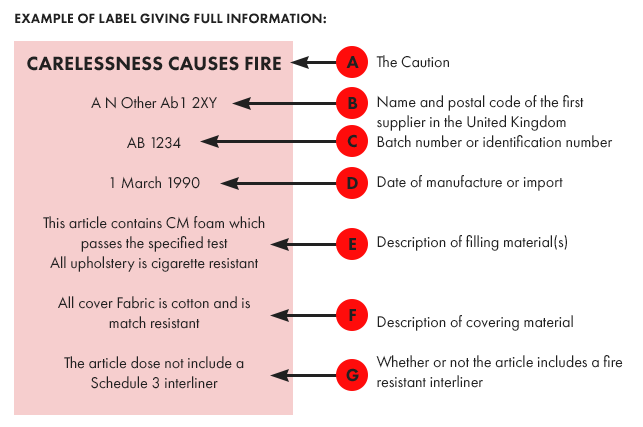 First, let's look at how you can tell whether or not a product complies with the Furniture and Furnishings (Fire) (Safety) Regulations 1988. Underneath the sofa or chair you will find a label that should be fixed on permanently. It needs to contain specific information. It must look like the label above, either the full information version as shown or the 'shorter' version. Be warned, however, that even if the correct label is present, the sofa may still not actually comply in its finished form - but at least this is a reasonable indication that it may be fire safe. Are you more concerned about the fire safety of your furniture or its flame retardant content? Before looking at this question in detail, it's worth asking yourself the question, why do some products have to be fire-resistant and not others? We're told, for example, that sofas and mattresses and prams must be able to resist fire. But why are there no flammability requirements for bedding? Most duvets, for example, will erupt in flames very soon after being exposed to flame, which rather raises the question of what is the point of mattresses being flame resistant. Since the Furniture Regulations came into force in 1988, smoke alarms have hugely increased both in numbers and effectiveness, while at the same time smoking at home has also massively declined. Why then do we still have such strict flammability requirements for sofas and mattresses? Well, you may find some answers to that question elsewhere on this site. Regarding fire safety, in theory you should be able to buy any UK sofa or mattress secure in the knowledge that it will be the safest from fire of any in the world. Unfortunately, it's not quite that simple. Leather-covered sofas, since leather passes the match test naturally (and without chemical treatment). You may, however, want to look into the kind of leather used: much of it these days is in effect leather dust glued together and all kinds of chemicals can be used in the process. Sofas which contain a 'Schedule 3 interliner' (see labels above). This applies to cover fabrics which are mostly made from natural 'cellulosic' materials like cotton or wool. The good news is that because these materials are naturally fire-resistant, they do not need to be treated with flame retardant chemicals. Instead, a liner is placed between the cover and the filling which must pass another, similar, flammability test. Flame retardants are used in these interliners, however, and there is growing evidence that they can be toxic; also, interliners aren't always reliable. For reasons that nobody appears to know, the Furniture Regulations only apply to the fillings in mattresses, and there are no labelling requirements. Mattress cover fabrics need to comply with a British Standard called BS7177, which does have a labelling requirement (see bottom of page). Providing this label is authentic, the mattress should at least be resistant to match/small flames. By law, the fillings must also pass the required tests under the Furniture Regulations. However, sheer logic brings this claim into question, i.e. fire will obviously start in bedding on top of the mattress - duvets in particular can be incredibly flammable; therefore by the time flame reaches the mattress it is hugely greater than a match flame source and will completely overwhelm any benefit that the match test provides. If you're concerned about fire safety, you need to be wary of anyone selling an 'organic' or 'natural' mattress, claiming their products are completely free of flame retardants. The truth is, it's extremely difficult for say cotton mattress covers to pass the match test without FRs, and it's all but impossible for 100% natural latex foam filling to pass the fillings test. Which means many such manufacturers cheat. They either use flame retardants and lie about it or they do not test their fillings to the correct test. It is of course very hard to find out which is the case! If you're worried about fire safety, therefore, you may need to ask your organic/natural supplier to be more specific, especially where fillings are concerned. Ask them if their fillings comply with Schedule 1 or 2 (as appropriate) of the Furniture and Furnishings (Fire) (Safety) Regulations 1988. Children's mattresses must comply with the same flammability requirements as adult mattresses. Small items, like prams, buggies and car seats must also comply with the Furniture Regulations, i.e. pass the cigarette and match tests for the covers, and any fillings present must pass the fillings tests. Of course, this means they tend to contain flame retardants (see below). It's very difficult to find sofas/mattresses/baby products in the UK that have not been treated with flame retardant chemicals. It doesn't help that the furniture industry is very conservative and has not exactly been breaking a sweat to find alternatives, even though they definitely exist. You can look for 'organic' and/or 'natural' products but see above for problems with these. As said above, leather sofas tend not to contain flame retardants in the covers, and it's in cover treatments that you find the most toxic variety - brominated flame retardants. Also, as we've seen, these wear off easily. The fillings in leather sofas almost always contain flame retardants. Also as above, you can avoid some of the worst flame retardants by buying sofas with a Schedule 3 interliner. Be warned, though, that interliners still contain flame retardants - possibly not as bad as brominated FRs, but still potentially toxic. See above regarding 'organic' and 'natural' mattresses. Providing you aren't too bothered about fire safety, you will probably avoid most (but not all) of the nastier flame retardants by buying this kind of mattress. They tend to be expensive, however, partly because they use better materials and partly because they aim for the higher end of the market and therefore are better made on the whole. The Furniture Regulations apply only to suppliers based in the UK, i.e. they do not apply to UK consumers. This means you can buy from anyone not based in the UK - e.g. Germany or Sweden or the USA - providing they are prepared to ship to you direct or you go pick it up yourself. But be warned, you cannot later sell on your sofa/mattress, etc, because you then become a supplier. Very few European manufacturers use flame retardants in sofas/mattresses/baby products. Germany and Sweden in particular are strongly opposed to FRs in products. If you're shopping outside the UK, therefore, check retailers' websites and/or contact the company to find out about their position on FRs. Yes, you'll have to pay for delivery but that is not a huge problem where small items are concerned. And even with larger objects like sofas, the postage will be at least slightly off-set by the fact the lack of flame retardants will have reduced manufacturing costs. To get this in perspective, it costs around £60 to treat a typical UK sofa. A lot of people have written to me recently, especially after reading this guide, to ask about buying furniture made before the implementation of the Furniture and Furnishings (Fire) (Safety) Regulations 1988, e.g. because such products do not contain flame retardant chemicals. The Furniture and Furnishings (Fire) (Safety) Regulations 1988 apply retrospectively. Any upholstered furniture made between 1950 and 1988 must comply with the FFRs. Clearly, however, it doesn't, since the regulations did not exist in those days to be complied with. This means that no one can legally sell furniture to someone else in the UK that was made in this period. Why? Well, like so many of the FFRs' requirements, it isn't entirely clear. The reasoning that is sometimes given serves, naturally enough, to support the introduction of the regulations. It says that furniture made between 1950 and 1988 is highly flammable, particularly due to foam fillings. Furniture made after 1988 must pass the flammability tests, which means in effect that foam in new fillings must be 'combustion-modified'. As can be seen elsewhere on this site, however, there are problems with this reasoning not least that it's been proved that a typical UK sofa treated with flame retardant chemicals is actually more dangerous than a typical EU untreated sofa (which in effect is the same as UK furniture before the regulations came into force). And the fire resistance of both is about the same. Which means we have the strange situation whereby you can buy a dangerous sofa/mattress legally in the UK but cannot buy one that is less toxic and no less fire-safe. You may be thinking, therefore, that it would be good to buy furniture made before 1988 because it's less toxic, i.e. while the kind of foam used in such furniture is toxic when it burns, it's far less so than with post-1988 foam. But as said it's illegal to sell it. Never mind, because in fact plenty of such furniture is sold – as a quick zoom around the internet will demonstrate. What does not appear to have been thought about in 1988 is that over time, furniture made in the 50s, 60s, 70s and 80s, would become desirable antiques, at least in some cases. Also, there has been a growing market in the UK for furniture from the same period made in places like Denmark. What are the ramifications for me if I buy illegal furniture made in this period? There are no immediate problems for you because the FFRs apply only to the supplier – the person selling you the piece – not to you. Legally, however, you cannot later sell the piece on, because that makes you a supplier. But see section below on enforcement. Trading Standards enforce the FFRs. However, they have had their funding so severely slashed over the past few years that they rarely prosecute transgressions of the law and when they do have to pick cases carefully. They are probably unlikely to go after what is now largely a high-end market where a court may well assume that the seller and the buyer were fully aware of any risks involved. Trading Standards are also well aware that in 2014 the government proved the FFRs mostly do not work; therefore, there is a good chance that a defending solicitor for the seller would raise this point, arguing that his client's product is actually less dangerous than a compliant piece. As always seems to be the case, the poor bear the brunt of bad legislation. The well-off can afford more expensive modern furniture without flame retardants, or antique furniture that is also flame retardant-free. The poor, however, suffer the double-whammy that cheaper materials tend to require more flame retardants and need replacing more often, therefore introducing regular new batches of poison into their homes. And should it catch light, of course, the resulting fire will be far more toxic. "These elements include silicon sprays to ease assembly or create a water resistant finish, and spray adhesives which are used in a variety of places in order to hold foam together or prevent fibres from slipping. These additional elements can have a catastrophic effect on the flammability of materials to which they are applied. When these elements are applied they are often in close proximity to the cover." Just for good measure, these treatments are also toxic, as the various warning signs on the cans will tell you. Which means that they add to the toxicity of the sofa in its normal day-to-day state and hugely add to the toxic fumes created if it burns. The Guardsman Protection Plan is sold by many retailers. Under this plan, your sofa may be pre-sprayed with stain repellent (but see below on legality) or a more DIY approach may be required. If you go to this page on the Guardsman website there is a helpful video showing a confident-looking technician visiting your home to fix your sofa. But if you read the wording under it, you'll see that he will only turn up to fix physical damage; if you have a stain, Guardsman will send you a bottle of their stain remover (standing well back) and you have to apply it yourself. This is odd, e.g. it's difficult to imagine say a car insurance scheme under which, if your car suffered a scratch, they'd send you a can of spray paint and tell you to do it yourself. However, Guardsman technicians are protected by health and safety at work laws . . . could this be a factor? Well, Guardsman also helpfully provide a link to the data sheet (required information about the potential hazards to health and the environment) for this spray (although it's not too easy to find), just in case you're worried, and I'd strongly recommend you take a close look at this. You might wonder why, in light of the many hazards described in it that Guardsman offer no advice on how to protect yourself when using their spray. Seems like their own technicians would rather avoid it, however. You may also wonder if this practice of stain repellent treatment in general is legal. Well, if it's applied after fabrics have been tested then it isn't, although manufacturers pretend it is. A few years ago, we discovered this common practice of Scotchgarding; as a result the BFM (British Furniture Manufacturers' Association) issued a press release claiming that the Furniture Regulations only apply to 'virgin materials'. What they meant was that the fire tests required under the Regulations apply to separate cover fabrics and fillings before the sofa is constructed. After construction, you can add any kinds of adhesive and stain repellent sprays you like even if that means the product is no longer flame-resistant. Well, profit will always find a way. However, the Department for Business issued a statement from its lawyers to the BFM and the rest of the industry which was very clear: a sofa must comply with the regulations at the point of sale. But guess what? They're still Scotchgarding sofas. Not only that but some retailers will try to persuade you to pay for extra years' insurance with the condition that you must have it treated with stain repellents first! Quite a parade of nice little earners in there; just a pity that the end result is more expensive to the consumer than it should be; that and it's far more toxic too. Obviously, it's your choice whether to pay for Scotchgarding/stain repellents or not. But it's important to know that this could be an illegal activity; it adds considerably to the toxicity of the sofa and it could well make your sofa flammable again! It's up to you to decide if that's worth reducing stains from the odd glass of wine spill or not. If something goes wrong with your furniture, you might find any complaint you make being directed towards the Furniture Ombudsman. But before deciding to use its services, you may want to consider the following. First, you might be surprised to learn that anyone can set up as an ombudsman in the UK. Yes, some are established by Act of Parliament, e.g. the Financial Ombudsman. But this is not the case with the Furniture Ombudsman. In fact, it used to share the same parent company and address as FIRA, the Furniture Industry Research Association (after complaints of conflicts of interests, it has now moved – about 250 yards south of FIRA's headquarters in Stevenage). What is FIRA? Apart from being a test house it is also the trade association for the furniture industry. And yes, what that means is that the Furniture Ombudsman is strongly linked to companies that pay to be part of FIRA, who pledge to reduce their costs in various ways, costs including dealing with customers' complaints. In short, the complaints system meant that the consumer complained to the furniture supplier, e.g. M&S. A technician was sent out to check the furniture who, in the example given on the programme, was not from M&S as the customer believed, but from FIRA. M&S is a paying member of FIRA. When, as was almost certain, the technician found in favour of the company, you could then complain to the Furniture Ombudsman. Which at that time was part of FIRA. FIRA have since claimed they are now separate from the Furniture Ombudsman, and I suppose that's true, at least by 250 yards. 'You and Yours' reported that furniture was 4th on the list of most complained-about products. In 2013, there were 38,000 complaints about furniture. How many of these were resolved in the consumer's favour? Well, if you do the maths presented on the programme, it's just 43. Out of 38,000. The Furniture Ombudsman's website today is rather confusing. It says of course that it's independent and claims it's free to the consumer. But if you click on the details, it turns out that it will cost you £125 to make a complaint. Considering the odds of success, that's probably not a wise investment. "The scheme was developed by the Furniture Industry Research Association in response to a series of high profile media and enforcement investigations, which culminated in the BBC's 'Fake Britain' programme in January 2014." What happened on this programme was that the production company nabbed various sofas and mattresses from big companies, had them tested to the requirements of the Furniture Regulations and claimed there were high failure rates. What FIRA doesn't mention, however, is that it was behind this programme, working as advisors along with Clarkson Textiles (the biggest furniture fabric chemical treatment company in the world) and the National Bed Federation. On the programme, FIRA's labs were used for the testing (even if much of it was not done correctly). It may surprise you to learn that the head of FIRA actually phoned me the day after the programme aired, to boast about all the additional testing work it was already getting from its own spooked members! For what may lie behind this apparently extraordinary situation, check the rest of this website. Oh, and the flame retardant and chemical treatment industries also did rather nicely out of the panic that ensued in that they raised treatment prices because, they said, they needed to add 30% more flame retardants to the treatments, to ensure fabrics comply with the fire tests. I'll leave you to ponder the interesting questions that this action raises. Here's the thing: all that FIRA's scheme actually does is in effect tell manufacturers that they must comply with the law. However, FIRA knows only too well that while the letter of the law can be complied with, furniture will still be flammable and unsafe (because the law does not work). Who provided the proof of this, as published on the Department for Business's website? You guessed it: FIRA. Why would furniture companies sign up to a scheme that they know is essentially useless? Well, speculation suggests that FIRA is pretty good at scaremongering and the entire industry now knows the Furniture Regulations do not work. So a compliance scheme can be touted as possible protection. At a cost, of course. You might be wondering why FIRA doesn't instead put pressure on the government to change the regulations so that they are safe for the consumer. Well, snouts and troughs and all that. ​Enough at least for you to question the 'independence' of the Furniture Ombudsman before parting with your cash.